The world needs no introduction to Shiamak Davar, the dance maestro has certainly redefined how the world looks at dance in India since he came along. Marking the beginning of a new era with his very first movie – Dil Toh Pagal Hai, he has since been at the help of all grand performances Bollywood has seen. Which is what got me so excited when I was given the honour to interview him for Ertsy ‘Growth’ so he could inspire everyone of our readers. For those who live under a rock, The Shiamak Dance Movement is the largest in the world and has reached out to over a million dance enthusiasts across India, Canada, Australia, United Kingdom and United Arab Emirates. Shiamak has introduced the world to new dance forms which are amalgamations of Indian and Western dance fused with his own personal style. 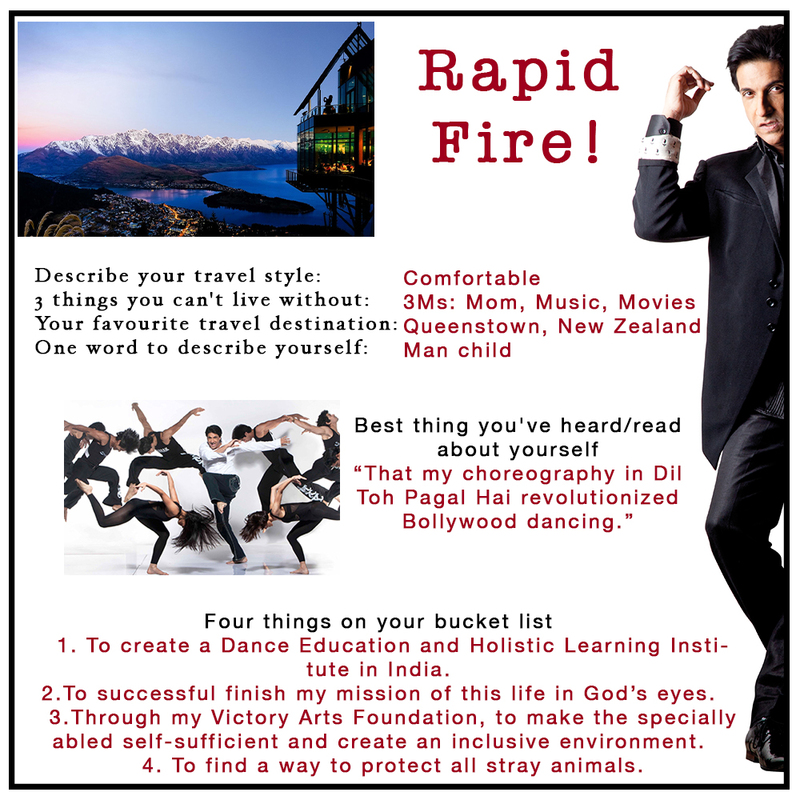 Read on to hear all about Shiamak Davar, his life and style! 1) What has been your biggest inspiration in life? My mom is my biggest pillar of strength and inspiration. Also the book, The Laws of the Spirit World by Khorshed Bhavnagiri has really helped me and is my guiding force. 2) What would you have been if not a dancer? Definitely something related to or in the field of performing arts. I don’t see myself doing anything other than performing, singing, acting, choreographing or directing! 3) What drives you to be a better person every day? Everyday just going back to the book I mentioned and taking time out to read even a short excerpt reaffirms the importance and my believe of humility. Faith is extremely important. The understanding of being a better person than a better dancer or choreographer is the key. 4) One thing you do to keep yourself grounded? Through the suffering, I learn from my mistakes and try not repeating them. So in tough times, now I’m more aware and get over situations faster. Humility, faith and prayers are the most important to stay grounded. 5) A message you want to give to the young dreamers, striving to achieve. You have to work hard and be patient. Before you think of becoming professional, take time to train and learn. Most importantly, be original! Dance requires a lot of dedication, but if you love what you do, you will smile your way through! If you’re an aspiring dancer, here’s a chance for you to be a part of his amazing troop. The Auditions will be held in Mumbai on 25th February at Shiamak Davar’s ware house. If interested candidates cannot make it for the auditions, he/she can also send in their video entries and get selected through video auditions.